A triple treat in the western sky just after sunset on Friday, October 28: a close grouping of Venus, Mercury, and the slender crescent moon. Look towards the southwestern horizon just after sunset on Friday night (Oct. 28) and you’ll see a triple feature of Venus, Mercury, and the two-day old moon. And there's another planet treat in time for the pre-Halloween weekend, too. You'll need a good low horizon and a clear sky to see the first three objects since they will be very low in the sky, less than 10 degrees up. Binoculars may help. For reference, a closed first held out at arm's length covers about 10 degrees of the night sky. The accompanying sky map of the moon and planets here shows their locations on Friday evening. The moon will be a razor-thin crescent, and the so-called "dark" side of the moon — actually its far side facing away from Earth, which is not always dark — should be well lit by sunlight reflecting off the Earth. Venus should appear very bright, weather permitting. This may be the first glimpse you get of it this season, but it will soon be blazing bright every evening. 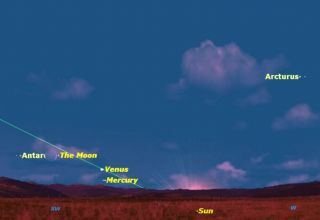 Mercury will be directly under Venus. All three objects will be very low because of the shallow angle the ecliptic — the path the sun takes across the sky — makes with the horizon on Friday. Notice that the sun is setting well to the south of the west point on the horizon, now that we're more than a month past the fall equinox. The only days the sun sets due west is right on the equinoxes, which were March 20 and Sept. 23 this year. A few minutes after sunset, turn around and look at the eastern horizon. You will see Jupiter rising there slightly north of due east, the brightest object in that part of the sky. At 10 p.m. EDT on Friday (0200 GMT Oct. 29), Jupiter will be opposition, exactly opposite the sun in the sky. On this night, Jupiter rises at sunset and sets at sunrise, so is visible all night long. Binoculars or a small telescope can reveal Jupiter's four bright moons, allowing you to follow them as they constantly shift position, orbiting around the giant planet. If you have a telescope, be sure to train it on Jupiter. You should easily see Jupiter’s two main equatorial belts. If you're lucky, you may see the Great Red Spot, looking more like a pale indentation on the south side of the South Equatorial Belt. Many observers this year are reporting dense dark markings called "barges" within the North Equatorial Belt. As always, keep your eye peeled for shadows of Jupiter's moons passing across the planet's face. If you miss the show Friday night, don't despair. The moon will move on in its orbit, but Venus, Mercury, and Jupiter will remain in pretty much the same positions over the next few weeks. This is a particularly good opportunity to spot Mercury, since it will be within a few degrees of brilliant Venus for nearly three weeks. Again, binoculars will be a great help in spotting Mercury's tiny speck of light. Editor's note: If you snap an amazing view of the moon, Mercury and Venus together, or of Jupiter or any other astronomical sight, and would like to share them with SPACE.com for possible stories or a gallery, contact managing editor Tariq Malik at: tmalik@space.com.